Would you like to invite me on a press trip, sponsor Get In the Hot Spot or advertise here? If so please email me details about your brand or product and request a media kit. If you’re in PR please read more about working with me below. Perhaps you need a travel writer, web copywriter or web designer or you’d like to hire me for blog design or a digital marketing or blogger outreach consultation? Maybe you’d like to interview me on your blog? Either way email [email protected] I look forward to finding our how I can help you. You can also connect with me on Twitter, Facebook, LinkedIn and Google+. 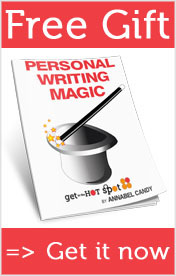 Get In the Hot Spot has a good working relationship with PR companies but generally only covers travel destinations, brands and products that Annabel Candy has personally experienced and enjoyed. Which means press releases won’t get your brand covered on Get In the Hot Spot but an invitation to experience something might. Annabel is available to attend product launches in Sydney, Melbourne and overseas subject to availability and if travel expenses are compensated. If you’d like to get a blog post dedicated to just one brand or product this would need to be paid sponsored content. Get In the Hot Spot is happy to accept product or experiences for trial. There is no guarantee that they will be written about or favourably reviewed but the pitch will be treated fairly. Giveaways: Most giveaways are sponsored blog posts and minimum values apply. Please email [email protected] for specific details and guidelines around giveaways. Get In the Hot Spot accepts paid display advertising, sponsored blog posts and sponsorship. For details about these opportunities, click here.